Another key part of planning a thru-hike is preparing your meals and food pick ups. You don't have to carry all of your food for the entire trip. Usually you can mail some ahead to a camp or post office, or buy extra along the way. Picking what to eat is important because your body needs fuel while you're hiking. There's different estimation formulas for how many calories you burn per hour of hiking, but its a lot. If you eat 2000 calories in a normal day, plan on nearly double that during a strenuous backpacking trip. The last thing you want to do is be caught starving because you didn't bring enough food to keep your body going. In addition to packing plenty of food, it needs to be light enough and compact enough to fit in your pack without adding too much extra weight. In many cases when you are traveling in bear country you are required to pack your food in a bear canister like the one in this picture on the top left. The bear canister is both a blessing and a curse. Its heavy, and difficult to pack, but it also forces you to think critically about all of your food items. 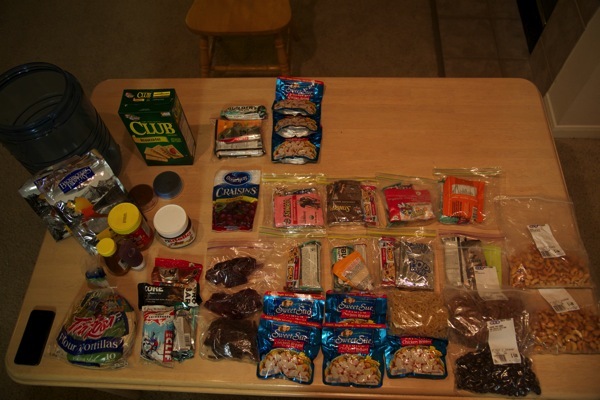 The food in the image above is everything I'm bringing for the first 8 days that I am on the trail. The first meal of the day is always important. You generally want to eat something large to get your metabolism going. When I am hiking though I tend to bring something to eat right when I wake up, and then a few things to much on during the first few hours of the day. I find that having a constant stream of energy keeps me going longer and feeling better. For breakfast I'm bringing a combination of pop tarts, clif bars, and various energy foods like Stinger gummies or energy gels. I'll eat the pop tarts or clif bars first, and keep the other smaller items for later. Lunch is usually pretty simple. I'm bringing plenty of crackers, and a mix between summer sausage and chicken. Getting protein out on the trail is hard, so anything like chicken or tuna that can be packed along is a great value. I want to always have something to snack on when I need more energy. Nuts are a great snack food because they're so calorie dense. So are raisins, beef jerky, and of course extra Clif bars. I'm taking a mix of cold dinners that require no cooking, and hot dinners that require you to cook or boil water. The cold dinners are pretty simple: Tortillas, Peanut Butter, and Nutella. The hot dinners are a bit more exciting. Tortillas are also an essential ingredient in making quesadillas, so that will be one meal. I'm also a big fan of Mac and Cheese and Chicken (MCC), which gets you plenty of protein and tastes delicious on a cold night after a long hike. Unfortunately taking coffee on a low impact backpacking trip is a bit of a nonstarter. You can't leave the used grounds out on the ground to attract animals, so your only option is to pack the grounds with you. Instead of worrying about that, which would be extremely messy and frustrating, I'm just taking some espresso beans that have been covered in chocolate. This'll get me my coffee fix and my candy fix at the same time. This is a great trick if you're looking to bring coffee on the trail but unsure of what to do about brewing and grounds. All of this then gets to fit into that bear canister and into my backpack. There's an identical set of food waiting at my resupply point too. Of course, this won't stop me from buying a cheeseburger in town along the way, if I can find one, and I'll absolutely be craving a taco when I get back, but this should be enough to keep me going along the way. In the backcountry, food is fuel to keep your body going, but you can still have a little fun with it if you want to. I'm about to set out on an exciting adventure to hike the John Muir Trail, a thru-hike from Yosemite Valley to Mount Whitney in the California high sierras. I've been on plenty of backpacking trips, including several very long ones, but this will be my first thru-hike. Thru-hiking means you hike an entire trail start to finish. While the JMT isn't quite as long as the Appalachian Trail, the Pacific Crest Trail, or the Continental Divide Trail, it still presents the same challenge which is you need to carry everything you need for the while journey with you, as well as plan your food resupply stops along the way. Selecting gear for a long backpacking trip, especially a thru-hike, is very important. There needs to be a balance between weight, size, utility, and at least a modicum of comfort. Here's a breakdown of the gear I'm planning to bring with me, as well as some explanation on the purpose and thoughts behind some of the items. When you're backpacking you have to bring your home with you for the whole journey. For the 16 day trip my home will include a Big Agnes Copper Spur UL2 tent, a Western Mountaineering UltraLite sleeping bag, and a Thermarest NeoAir sleeping pad. I picked these items because they're the lightest, most compact at a good price, provide great protection from the elements, and are warm and cozy. You don't have many chances to do laundry on the trail, but you also can't be carrying many changes of clothes either. Because of this, I'm bringing one change of clothes only - plus a third pair of socks. Socks are one of the most important items when you're hiking long distance and I'm very particular about the ones I bring. I've got three pairs of Teko socks, which is a brand thats served me well for many hundreds of miles. One other important point about clothing is the notion of layering. When the temperatures change the easiest way to control your body temperature is through adding or subtracting layers. My clothes system consists of 4 layers. I'm bringing two mid layers on this trip so that I can double up on long sleeves, which also allows me to leave the bulky/heavy fleece behind. The zip-t also lets you control your body temperature even closer, since you can zip up/down the collar and roll up/down the sleeves to adjust warmth. This should be fine as long as the temperature doesn't drop below freezing during the day. At night, I can just jump in my sleeping bag to stay warm. I'm bringing two bandanas, which also serve many purposes. You can use them for first aid, towels, cooling rags, wash cloths, etc. They are extremely useful. One of the main reasons I go backpacking is to take pictures. I'm bringing a Canon 6D DSLR, which has a full frame sensor that will be ideal for landscape. My workhorse lens will be the 24-105 F4L, but I will also have a 300 F4L for wildlife. Keeping the camera powered will be difficult, so I'm packing 7 total batteries as well as the charger, which I may be able to use periodically at staffed camps. I'm also bringing plenty of memory cards, in small-medium sizes so that my risk of losing photos is low if a card fails. Camera gear represents the bulk of my pack weight, but capturing memorable images is worth it so I am bringing it all with me. Normally when I go out in the backcountry I put aside technology and avoid the outside world. On this trip I intend to do things a bit differently. I'm bringing my iPhone, which I intend to use for a few purposes, and a Kindle Paperwhite with plenty of books stocked up on it. I'm also bringing a GoalZero Nomad 3.5 solar charger to keep both devices powered. There won't be any cell coverage where I'm going, so I won't have to worry about disconnecting from the outside world. But I am interested in seeing how I will use those devices in the wilderness. I've got a few apps that I'm excited to try, like Peaks, Night Sky, and Project Noah (an app for tracking the sightings of plants and animals). There are also practical reasons to bring the phone and Kindle. A Kindle weighs less than one paperback, so its a major savings in weight. An iPhone is also a virtual swiss army knife. It can double as a backup flashlight, GPS if you get lost, First Aid manual, emergency contact device, backup camera, voice recorder, backup map, etc. For the extra few ounces its absolutely worth bringing it on the trail. One of the best items to have in your kit is concentrated camp soap. Just one drop of "camp suds" can wash a whole pot. A whole bottle can wash a 747. Just a little goes a long way, which is important if you want to do laundry or take a bath out in the wild. Carrying all of this will be my Osprey Variant 52 backpack. The Variant is more of a climbing approach pack and winter ski/snowboard pack than a long distance hiking backpack, but there's two main things I like about it. The first is that it has a flat back panel, which is more my style. The mesh panel curved packs don't fit me well. The second is that it's fairly minimalist and simple. It's a standard internal frame sheet pack, which is very light weight, with a single large compartment for arranging all of your gear. It carries well, looks great, and is very durable. If you're ever out in the wilderness for a few weeks, this should be all you need to survive and have a wonderful experience in the outdoors. I can't wait for the trip, and I'll be sure to post plenty of pictures once its over.